The latest from Omenopus is an 8 song collection meant as an introduction to the band. 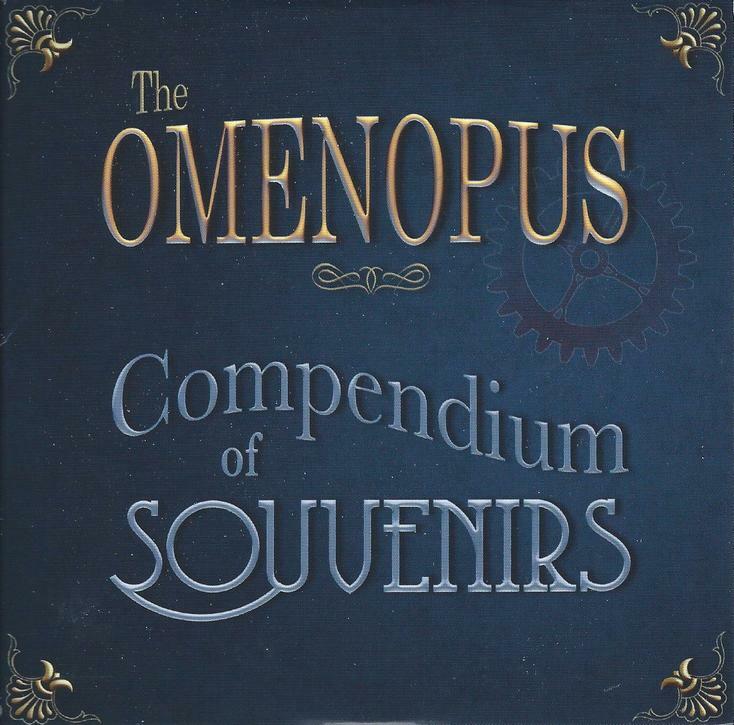 The Omenopus Compendium Of Souvenirs compiles tracks from previous CDs, some alternative mixes and a new track which features Omenopus covering Kraftwerk’s The Robots. The CD is FREE through the Omenopus web site! (You pay shipping). So these folks obviously want you check them out and I highly recommend that the uninitiated do so. The core of Omenopus is the trio of Lee Potts, John Pierpoint and Bridget Wishart. Two of the songs are Radio Edits from the 2014 album The Archives. The Archives is a sci-fi tale concept album and an epic in every sense of the word, continually shifting between music, song, spoken word sections, and loads of effects, making for a genuine sci-fi space rock tale. Stand Still is a searing, acid-laced, Space-Metal rocker, and Unreasoning In The Whys rocks hard but also includes beautifully spaced out symphonic dreamy sections, punctuated by high intensity laser blast effects. CLICK HERE to read the full review I wrote. Four of the songs are from the 2012 album The Plague, a two parter that was a mini concept album that the band described as “one woman’s allegory of England during the 1300’s as the plague and death advance across the land”, plus a 6 song EP titled Scars. My Secret Ghost is a cool rocker with Bridget’s trademark vocals. I love her instantly recognizable vocal style which combines breathy space whisper and theatrical flair. The Plague Part 1 consists of soundscapes and a repetitive looped effect, later joined by Bridget’s EWI wind instrument. Too Soon and Drums Of War were hidden tracks on the album. The former combines drifting melodic ambience and string instrumentation with a slowly strolling electro pulse. And Drums Of War has a Pink Floyd circa The Wall feel. CLICK HERE to read the full review I wrote. Truth & Lies is a remastered edit from the 2010 Time Flies album. It’s a beautiful song that combines a pleasant melody and Bridget’s distinctive vocals with an electronica driven rhythmic pulse, ambient orchestration, chunky guitar and a lovely violin solo. Lots going on here. Finally, and all Omenopus fans will want to hear this, is an unreleased cover of Kraftwerk’s The Robots which Omenopus take in a very different direction. They retain the Kraftwerk quirkiness of the original, though this is a high tension wire act with searing electro Metal blasts and an army of pummeling effects, but also brief dreamy ambient interludes. VERY cool. Take the band up on their offer.